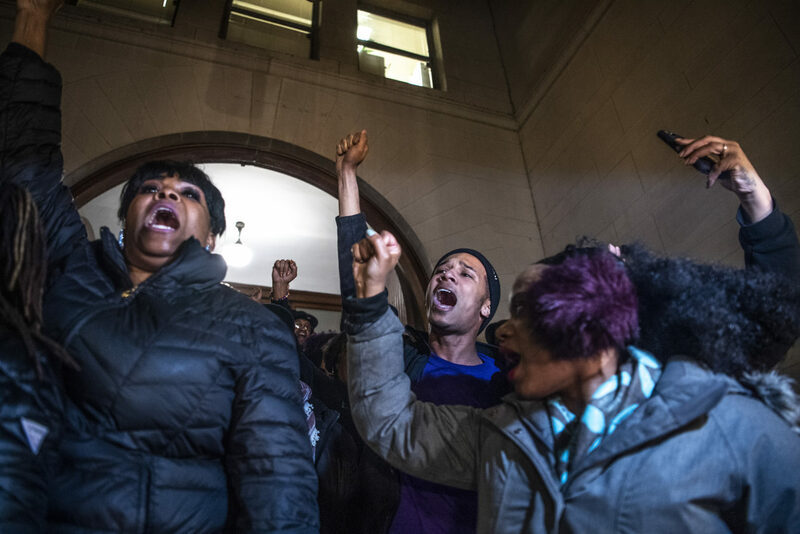 PITTSBURGH (AP) — Shots were fired overnight through the office window of the attorney for a white police officer acquitted in the shooting death of an unarmed black teenager, and several hundred people gathered in protest Saturday over the verdict that left Pittsburgh a city on edge. The jury’s decision late Friday in the killing of 17-year-old Antwon Rose II upset his family and touched off a nighttime demonstration by about 100 people. It was followed by another protest on Saturday afternoon at an intersection called Freedom Corner in the city’s Hill District neighborhood, the historic center of black cultural life in Pittsburgh. One man held a sign with the names of black men killed by police around the U.S.
After the verdict, a group of about 100 protesters headed to the trendy East Liberty neighborhood, a few miles from the downtown Pittsburgh courthouse, where they blocked intersections and briefly entered two hotels, chanting “17” for Rose’s age and reading a poem written by Rose. Manko, the district attorney’s spokesman, responded by saying prosecutors were confident that the video, “along with common sense and the questions we knew we were able to raise about the defense expert report,” would be enough.